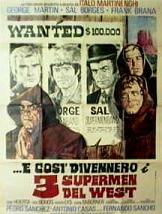 Rarest entry ever in the long-running 3 Fantastic Supermen series, this time taking our heroes on a bizarre spaghetti western-like romp. Stars George Martin, Sal Borgese and Frank Brana. (In Italian language, with no subtitles).